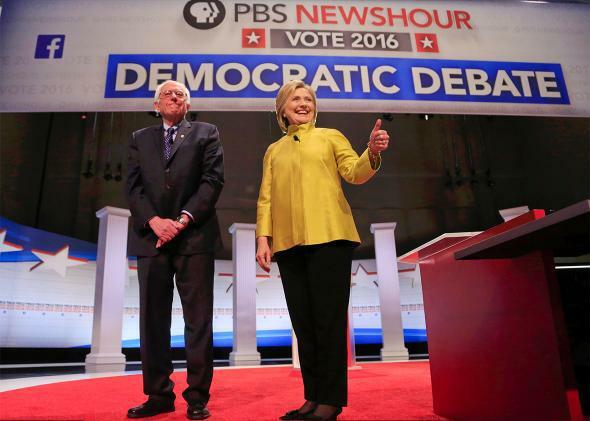 Sanders calls out Clinton on social security at PBS debate. Clinton’s Social Security Plan Is a Little Hazy. And Sanders Called Her Out on It. The candidates got a tad testy over Social Security at Thursday night’s PBS debate. Can we talk about the candidates’ plans for Social Security? Yes, we can. Here was an instance in which Bernie Sanders came armed with specifics and Hillary Clinton, usually the master of detail, offered not so much. Sanders is currently sponsoring a Senate bill that would give Social Security beneficiaries a boost of about $65 a month, which he would pay for by adjusting the payroll tax cap. As of right now, Social Security stops taxing earned income at $118,500. Under Sanders’ proposal, the Social Security Expansion Act, income in excess of $250,000 would be subject to Social Security taxes. He would also tax the investment income of high earners to support Social Security, another thing we currently don’t do. Yes, the wealthiest people, the top 1.5 percent will pay more in taxes. But a great nation like ours should not be in a position where elderly people are cutting their pills in half, where they don’t have decent nutrition, where they can’t heat their homes in the wintertime. That is not what America should be about. If elected president, I will do everything I can to expand social security benefits, not just for seniors, but for disabled veterans as well. Clinton’s position on Social Security, meanwhile, somehow manages to be both specific and diffuse at the same time. She’s offering people (usually women) a credit toward future Social Security benefits when they take time of out of the workforce to handle caregiving responsibilities. She’s also proposing a change in how benefits are calculated when a spouse dies, so the surviving partner (usually a woman) doesn’t lose half or more of the family’s Social Security benefit. She does not—and said so in the debate—plan to expand everyone’s benefits. In all due respect, Secretary Clinton, a lot of the progressive groups, the online groups, have really asked you a simple question. Are you coming on board a proposal and what is that proposal? The proposal I outlined should be familiar to you, because it’s essentially what Barack Obama campaigned on in 2008. You opposed him then. I would hope that you would come on board and say this is the simple and straightforward thing do. That was a successful hit. Not a huge one, maybe, but a hit nonetheless. In fact, Clinton did oppose raising the payroll tax cap during the 2008 campaign. And Social Security advocates have been concerned until very recently about her positions in 2016, noting that her website says she would “oppose” benefit cuts or raising taxes on the “middle class” to close the Social Security shortfall. What did that mean exactly? The result was this exchange with Sanders on Twitter last week, in which Clinton committed to not cutting Social Security. But Sanders offered up a reminder Thursday night that Clinton’s position isn’t as comprehensive as his. And it may soon need to be. And, oh yes, all of this is important because without Social Security, the Census Bureau estimates that half of all Americans 65 or older would live in poverty. That’s something everyone should remember. Correction, Feb. 12, 2016: The article originally misquoted a debate question by paraphrasing it, rather than quoting the moderator word-for-word.